“Kids earn money for things they want. I have an idea to raise funds for the new digital camera and photography software that I want,” Amanda clapped her hands and smiled while walking around Patty’s room. She noticed that Patty’s books and papers were neatly organized in a corner desk and hutch arrangement. “What is it?” her friend Patty asked twirling a strand of long blonde hair with her finger. She was lounging on a pink and white bedspread. “We can start a research service for students in our school.” Amanda sat down on an antique white chair at Patty’s desk and drew dollar signs on a piece of paper. “This is different. I can use my mobile phone to look on the Internet for information useful to kids working on homework assignments.” Amanda adjusted her glasses on her pointed, angular nose. “What do you want me to do?” Patty asked stretching her long legs on the bed. “I did a fantastic job! But that was only because I was good at convincing adults to buy ten boxes at a time. I am not so sure I could do the same thing with kids my age. How many kids earn money selling girl scout cookies? I still have my doubts about this new scheme of yours,” Patty sat up straight and shook her head, thin blonde hair flying about her shoulders. 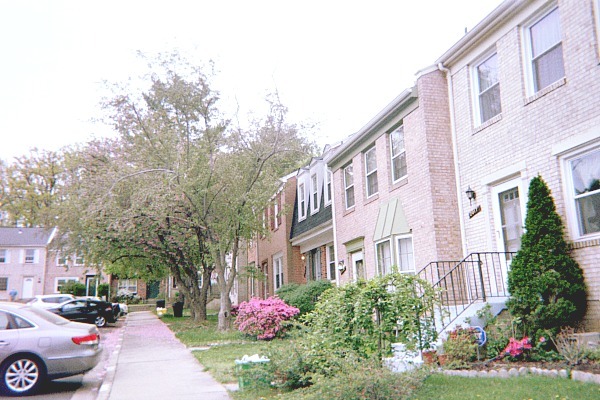 Amanda and Patty are planning their homework for sale business in one of these townhomes. “This is what I worked on in the library. I listed who, what, where, when, why and how. The questions Mrs. Sharp suggested we ask when we are writing school reports. Then beside each question I wrote the answers that we should consider as we go along on this paper entitled ‘Amanda and Patty’s Business Plan’,” Amanda explained to Patty showing her the paper as she sat down next to her. The bed was soft and comfortable. “I’ve always wanted a TV for my room. How many kids earn money in our class to buy a new TV?” Patty sighed and looked into Amanda’s hazel eyes. “We can add that to our goals column,” Amanda said. “How are we going to earn enough money for all three things?” Patty looked worried. “By word of mouth, flyers, Internet research and hard work. If we charge $1 a search request and have 50 kids needing help with 5 subjects each we could easily raise…” Amanda punched in the numbers on her calculator. “250 dollars. Do you think you could have some flyers ready for Monday?” Amanda noticed that Patty was sitting with her back against the wall and had closed her light blue eyes. “I guess so. But do you really think we can find that many kids who would be interested in our service?” Patty bit her lower lip. “I know we can! What do you think?’ Amanda waited patiently for Amanda’s answer. Amanda and Patty arrived at school one half-hour early Monday morning to hang flyers in the halls, cafeteria, and on the school bulletin boards before first period. Amanda talked to many kids in between classes about the new service she was offering. A few kids said they had homework assignments already and asked Amanda to help them with their research. By the end of third period Amanda and Patty had ten customers who needed help. “I am excited about what we have accomplished this morning,” Amanda said drinking her milk. “I am, too. I think that it’s great that so many kids need help with their homework.” Patty replied. “All it takes is a little bit of confidence and a great plan. I hope we can find the same number of customers after lunch. I am ready to go,” Amanda said finishing her milk. Amanda and Patty walked out of the cafeteria. They walked ten feet down the hall corridor and suddenly stopped talking when their first period teacher approached them. Amanda noticed that she was not smiling. Are Amanda and Patty in trouble? “Are you responsible for distributing this?” Mrs. Sharp held one of their flyers in her hand. Could this be Amanda and Patty's School? Amanda went to her other classes bewildered. She bit her nails and sat quietly at her desk. Why was Mrs. Sharp raising such a strong objection to the flyer? She couldn’t understand why they had detention. What was so terrible about a flyer describing a service that would help students with their homework? Amanda thought her plan was the best way kids earn money in exchange for services. She knew that Mrs. Sharp had been teaching eighth grade language arts at her school for many years. Mrs. Sharp believed that students learned best individually after only one classroom teacher gave direction. Mrs. Sharp was not impressed by the use of mobile phone technology in the classroom especially when mobile phones were used to surf the Internet. Amanda wondered if Mrs. Sharp was afraid to use mobile phones as an aid to her classroom discussions because she thought mobile phones would replace her as a teacher. Amanda needed a plan to convince Mrs. Sharp of the benefits of the use of mobile phones in the classroom and different ways kids earn money. At exactly 3:00 Amanda shuffled into Mrs. Sharp’s room with Patty trailing closely behind. “Come in, girls, and have a seat. I want you to read chapter three in your text books and answer the following questions,” Mrs. Sharp said as she passed out the assignment papers. “That’s the handout I used to develop our business plan for a way kids earn money,” Amanda whispered to Patty. “That’s enough girls! Talking in class is not allowed when you are with me in detention.” Mrs. Sharp looked up at Amanda and Patty. “This is the handout that I want you to complete for me today.” Mrs. Sharp gave a copy of the new handout to each girl. “I know where we can find the answers to these questions without looking in our books.” Patty said after receiving permission from Mrs. Sharp to speak. “Where can you find this information without using a text book?” Mrs. Sharp was curious. “On the Internet using a mobile phone. Patty and I can show you,” Amanda answered. Amanda pulled out her mobile phone from her backpack. Mrs. Sharp watched in astonishment while Amanda used her mobile phone. “I typed in https://www.thoughtco.com/geography-4133035 and clicked on the Homework Help link with my keypad," Amanda explained. “If you position the cursor over the words Nicknames of the Fifty States you can see that the words change color from blue to red and are underlined in red.” Patty showed Mrs. Sharp her mobile phone. “It’s easy. Would you like to give it a try?” Patty asked handing Mrs. Sharp her mobile phone. “Alright. Is this what you meant by providing research information for students and ways kids earn money?” Mrs. Sharp was amazed. “I am the one who learned something today. I thought you were encouraging your fellow classmates to rely on you to do their homework for them. I'm impressed with your plan for a new way kids earn money,” Mrs. Sharp sighed. Amanda smiled. “No, we wanted to provide them with the Internet search links so that they could do the research themselves. I have a written plan for the services we were planning to offer.” Amanda gave Mrs. Sharp a copy of the plan. “Thank you,” Amanda and Patty said at the same time. Both girls were so happy that they hugged each other. A few days later Amanda and Patty sat on the floor in Amanda’s room. Patty watched while Amanda counted the money that they had earned. “How much money do we have?” Patty asked. “I’ve counted about $35,” Amanda answered. “That’s not enough to buy what you want and my new TV too. I’ll have to find some more customers.” Patty looked down at the floor and pouted.